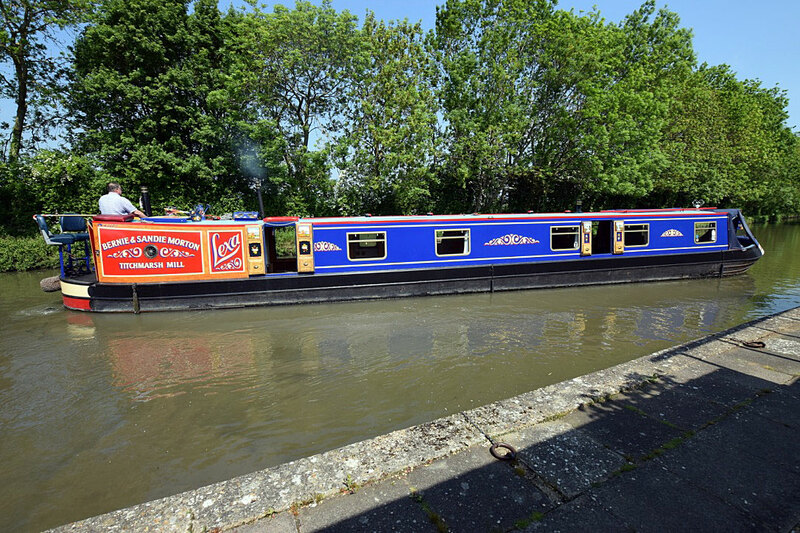 Lexa – 59ft 3″ Traditional Narrowboat is a classic example of a very well cared for traditional narrowboat. She was built in 1988 by Colecraft, fitted out by Rugby Boats and is in lovely condition with a Spiderworks repaint in 2016. The gas locker is at the front, housing 2x 13kg bottles, then comes the 4’ well deck with padded cushions over storage lockers along with a drop down table from the cratchboard. A new Titan cratch cover was fitted in 2016. Into the nearly 14’ saloon. The boat is fitted out in Pine T&G to the ceiling and upper walls with carpet lower down which gives a cosy cottage feel. The saloon features a large sofa bed, with a drop down seat opposite, storage and TV/DVD, the popular Morso Squirrel stove and a desmo leg table (additional collapsible stools are stowed next to the stove). The galley is a standard shaped arrangement with worktops both sides. A clever bypass tap under the sink ensures the Rinnai water heater provides hot water when the engine is not being used. The fridge is a 12v Inlander, and the cooker is a 4 burner gas hob, oven & grill. There is plenty of cupboard and storage space in here along with an enormous wine rack. The side hatch on the starboard side gives additional light & ventilation. The bedroom is next; the bed is 6’3” x 4’2”, at the foot of which are shelves & a half wardrobe with a clever cut out allowing tall people’s feet to extend!! There is lots of storage under the bed. The bathroom follows, home to a good sized shower cubicle, circular ceramic basin and Leesan Traveller pump out loo. In the corridor next to the bathroom is a pantry cupboard. The engine room follows, housing the 2013 refurbished Lister HRW3. This powers a Crowther 18 x 15 through a PRM260 gearbox. There are side hatches on either side in here and the inside panels and indeed boat rear doors were painted by renowned canal artist, the late Ron Hough. The boatman’s cabin is last. The woodwork in here is lovely; the cross bed offers a third double bed on board, and there is another wardrobe and plenty of cupboard space in here. The Epping stove is in very good condition. Central heating on board is via the Eberspacher, which also heats the calorifier. She was mostly re-painted in 2016, with the roof being done this year. Lexa – 59ft 3″ Traditional Narrowboat is a classic boat fitted out for long cruises or cosy weekends in your favourite spot, nothing to do to her but move on, start the engine & go!